Flowers are becoming few and far between here now. 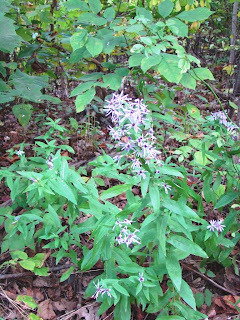 Asters of one color or another are still fairly reliably seen. That’s about it. This was, I think, an exceptional year for wild blooms. The spring rains and moderate summer temperatures were a good recipe for nearly everything, producing blooms both numerous and large. For much of the warm season, it seemed I couldn’t turn around without finding something new. I might stumble through thistles and emerge to find a patch of wild geraniums, as thick as if planted in a garden. Wild raspberry bloomed large and purple in the deep of the forest. Sometimes I wondered if I was the only one to see a bloom as it grew happily away from the eyes of others. I shall miss that, the surprise of finding something beautiful where I least expected it. Autumn, of course, has its own rewards, as does the winter to come. But for just a moment, I will lament the passing of the summer blooms and hope I shall see them again when next they fill the forest with color. Rain lasted all weekend here at Roundtop. A few times it threatened to clear, but within 5-10 minutes the rain would start again. The rain was needed, and it fell mostly as a nice gentle rain. I’m ready for it to be over. A couple of times while I was walking Dog or Baby Dog, I saw a few fall warblers, but without binoculars it was too far and too dark and dreary to identify them. By the time I got back to the cabin and returned with binoculars, they were gone. A few deer poked their noses out of the forest to crop grass or simply stand in the open for a few moments, but even they didn’t seem to have much ambition. This year’s crop of fawns have mostly lost their spots, though they are still pretty small. Some leaves are turning into their fall colors, though not the ones in today’s photo. The forest understory is thinning out. I can see the ground again for the first time in several months. My "green box" of foliage that surrounds me in summer is getting larger the greenery thins, and I no longer feel quite so confined by it. It will still be a month or so before I can see the mountain to my west again but at least I can see 50 feet or so now. 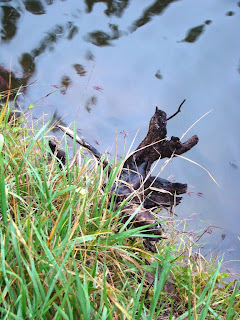 I was as lazy as a slug this weekend, no doubt affected by the rain and the dark skies. The dogs were little better, lolling at my feet, sleeping about 23.5 hours of the day. I could say I was simply following the pattern of the natural world around me this weekend, but even I don’t buy that one. I was as lazy as a slug, and there’s no getting around it. The time of the year has come when it is now too dark for me to take a photo in the morning before I leave for work. I will miss that. For a few weeks yet I'll still be able to take an evening photo, so the photos I post will only be 12 hours old or so. But in another month even that will be gone, and then it will be time to try and take a week's worth of photos on the weekends. I've never been able to perfect that routine. This morning I have a nor'easter blowing rain from the east. The weather people say I can't call this a hurricane as the storm doesn't have "tropical characteristics." But on the mountain where I sit, this storm doesn't look any different than Hannah or Gustav or Ike. One storm or another is supposed to keep my weekend a rainy one. The area can use the rain, so I'm not complaining, though I am looking forward to seeing what comes after the storm. I expect that a storm like this will push the weather, the migrants and the animals even deeper into fall, and that's what will be interesting to see. So until the weather clears, I will busy myself with the never-ending indoor chores that I don't enjoy nearly as much as playing in the outdoors. The dogs will curl around my feet, and the cats will cuddle close, prentending to be cold. I'll have a cup of tea in the afternoon and later, perhaps a glass of wine. It won't be so bad. Fall is starting to work color into the green leaves around the mountain. It’s still early in the process, but the basics seem right to hope for a season with extra-good color for a change. 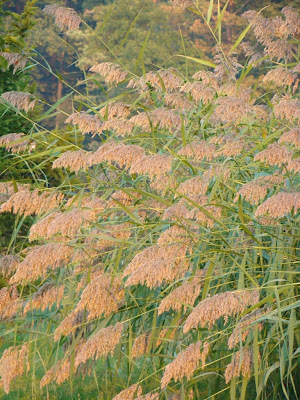 Weather in spring and summer dictates how intense (or not) the fall color will be. The best recipe for good fall color is a moist spring, followed by a cool summer and clear days and cool evenings in the early fall. So far, that’s pretty close to what I’ve seen here this year. I do wonder how the 30 days without rain in August will play into this equation, but the leaves and plants most affected by that seem to have withered and fallen already. In any event, the signs pointing to good color are far better than they’ve been for the past two years at least and perhaps longer. I’ll keep you posted. For the past several nights and mornings, I've heard both the Great-horned owl and Screech owls calling down in the valley. Though I can hear these calls in the summer, I associate them more with fall. Perhaps its simply that once the insect chorus fades away, the distant echo of owls can be heard again. The forest grows ever more quiet with each passing day. The dawn chorus is mostly gone, except for an occaisonal phoebe. The insect chorus is also fading, and I get the sense that everything around me is starting to prepare for the long sleep of winter. It's time for me to think about doing the same thing, to tighten the windows and secure the doors, to make the cabin tight again. The rythmn of the seasons are more evident here in the woods than they are outside it. If I forget, the forest is always there to remind me once again. This photo of the Black Witch moth (ascalapha odorata) is not as good as the one I posted yesterday, though I think you get a better indication of its giant size in this photo. I also have good news about this sighting. Both BugGuide.Net and the Butterflies and Moths of North America sites have accepted my sighting record! Butterfliesandmoths.org will update their state maps in January to include York County as the second spot in Pennsylvania where this moth has been seen. I feel as though I’ve just used up 30 seconds of my 15 minutes of fame! So now that Seabrooke identified the moth for me, I’ve been doing some research about this fascinating moth. It’s the largest moth, perhaps the largest insect, found north of Mexico. No doubt because of its extraordinary size, the Black Witch has a long and rather checkered folklore to accompany it. It’s also known as La Sorciere Noire, as well as the even more ominous Mariposa de la Muerte. Virtually all the common names allude to death, witches, sorcerers and the like. The most benign common name was Mah-Ha-Na in Mayan, which means "may I borrow your house" as it is not uncommon for these things to find their way indoors. The Black Witch is common in Florida and the Rio Grande Valley, migrating north out of Mexico and Central America. They have been found in all 50 states, though Alaska only has a single record, apparently. Death myths abound surrounding this lovely moth, mostly in force only if the moth gets inside a house. Here’s a few: a sick person will die if this "butterfly of death" enters the person’s house; the person will only die if the moth visits all four corners of the house (I can just imagine the rush to prevent this one); or if someone has already died, the moth is said to be an embodiment of that person’s soul returning to say goodbye. A few myths are good ones—you’ll win the lottery or come into money if the Black Witch lands above your door and stays there for a while. In the Bahamas they are even call Money Moths or Moneybats. One myth is a funny one—if the moth flies over your head you will lose your hair. 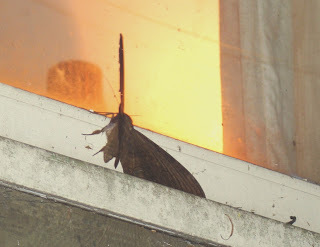 So how did this tropical, far southern moth end up fluttering at my bedroom window? This moth has been confirmed to be seen within the eyes of hurricanes, and since Ike and Gustav both made an appearance here, perhaps instead of a hurricane bird, I got a "hurricane moth." I’m not complaining, and if you’ll excuse me, since I don’t feel ill I’m going to go buy a lottery ticket. My guess that my moth photo in today's regular blog entry was a Polyphemus moth was wrong. The correct identification is even cooler and rarer. My moth is a Black Witch moth, normally a native in the tropics of Mexico and also in our southern states. However, this moth, which is often mistaken for a bat, as I did initially, has been seen at least occasionally in every state in the U.S., including Alaska (once near Auke Bay near Juneau). Thanks to Seabrooke at The Marvelous in Nature for correcting me on this identification. I simply wasn't looking at species that are normally found outside this area as a possible choice. Heaven knows, I had enough choices as it was without looking for moths from the tropics. 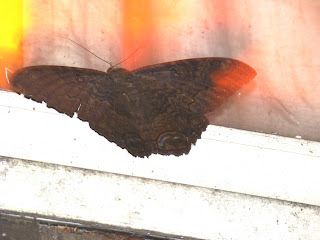 The Black Witch moth has a lot of interesting, if somewhat creepy, folklore associated with it, and tomorrow I'll tell you a little bit about some of that. It's never easy. Why do I always expect it to be easy? Sometimes identifying a species that I don’t know turns out to be harder than I expect it to be. This was true years ago when I was just learning bird species, and it’s true today. For some reason, the field mark that always jumps out at me, and which I’m convinced is the one to focus on, never turns out to be the one I need to identify whatever critter or plant I’m looking at. That was painfully obvious to me again two days ago. It was evening, just before bedtime, when I heard a noise at my bedroom window. At first, I didn’t even realize the sound was coming from my window. It sounded like a soft and fast rat-a-tat noise. I thought perhaps they were discharging unused paintballs over at the paintball field, but that was long dark. Then I thought my heat had come on, but I haven’t turned my heat on yet. Still, I went over to the heater under the window to feel the baseboard just to be sure. And then I saw it. My first thought was a bat. I thought I had a little fruit bat at my window. How cool! Then I looked again. It was a moth! And not just any moth. It was the biggest most I’ve ever seen in my life. This moth was easily 5+ inches across. From inside, the underside of said moth was a typical mothy color—various shades of brown. 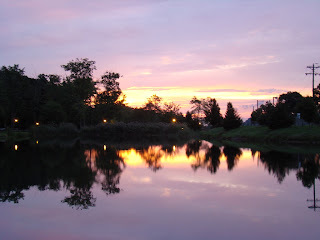 So I rushed outside with the camera, determined to try for a photo. That’s when I got the one you see here. Still, as it was dark outside, and both the flash and interior light affected the moth’s color, I couldn’t really tell what markings it had or much about its colors. I wasn’t overly concerned, though. I had a semi-decent photo, a good moth book, and really, how many giant moths this size can there be? Wrong. There’s lots of them. After hours of investigation, my best tentative guess is that this is a Polyphemus moth, one of the largest of the giant silk moths. Here's a link to some nice info and a much better photo of one in daylight. My moth is probably a female, as its antenna isn’t very bushy. I had to lighten the photo somewhat to see the eyespots. What really threw me in the identification is that the edges of this moth’s wings are very worn and raggedy, which I thought was how they were supposed to be. So I was looking for photos of giant, raggedy-edge winged moths. However, the Polyphemus moth’s flight begins in August and this being late-September, I guess that’s what happens after they’ve been out in the world for a month or so. The size of my moth fits the size of the Polyphemus, as does the location, the timing of its appearance and the abundance of host plants such as oak, beech, sassafras, hickory and wild cherry. So that’s what I’m calling it—unless any of you have a better idea. 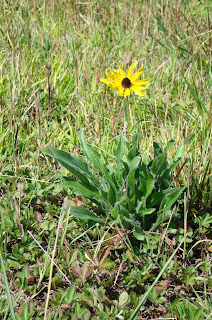 This morning’s photo isn’t the last flower of summer, on this, the first day of autumn, but in a field that only a month ago was filled with brown-eyed susans, it is now the last one blooming. The days and nights are cooler. The cabin is filled with plants again, and only my very large fig tree remains outside. Bringing that in is a major project, and I just ran out of time this weekend. I continue to see and be followed regularly by one of the red foxes. I’ve figured out that walking with a dog is what makes the fox less wary. Yesterday, the fox came within 20 feet of us in the early pre-dawn almost-light. The fox sometimes sat down and watched us, once even lay down under a tree for a few seconds. Then it padded behind us, sniffing at Dog’s footprints. So far, it’s been only Dog and not Baby Dog that brings out this behavior in the foxes. Perhaps it’s because Dog strains so much against the leash that he gasps for air, which sounds a little bit like a fox’s bark. Perhaps it’s because he looks like a very large fox himself with his bushy tail, pointed ears and fawn color. Perhaps it’s a gender thing, as he’s male. Perhaps it’s because Baby Dog barks, and the fox doesn’t like that. I don’t know. If you have even a slight curiosity about hawkwatching, tomorrow, Thursday and probably Friday are likely to be prime days. We are approaching the peak of the Broad-winged Hawk flight, a small soarer that is one of the few raptor species that likes to fly in a group. On a good day, you can see thousands here in the east. On a good day in the midwest around the Great Lakes, you could see tens of thousands on a single day. On a good day in Texas, you might see 100,000 thousand of them. These crow-sized hawks are not the world's best fliers, despite their twice yearly migration down into central Mexico. They like to fly the easy way. They like to ride thermals created by warm pockets of air. They don't like much wind, not even a tail wind. The wind breaks up their thermals. So these birds circle and circle, gaining altitude with each circle. When they reach the top of the thermal, they peel out in single file and soar to the next thermal. For the eastern birds, their route takes them southwest, and they are forever gliding slightly off course, only to readjust their route with every thermal. As a result of this constant readjustment, broadwings can also be notoriously difficult to predict, both as to their exact timing and their location. 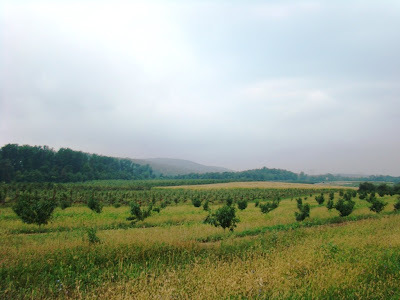 Certain places are more likely to see large concentrations than others, though even a non-descript cow pasture has the potential to be a broadwing hotspot if the winds take them over it. Roundtop is not the best broadwing spot in the world, but sometimes and in some years, it has been spectacular. Today I saw 8 late in the day, in an hour's watching. Tomorrow, I hope to spend most of the day on the mountain, hoping that this will be the year I see thousands here. Better broadwing spots in this area are Hawk Mountain and Waggoner's Gap, usually. If you're not a regular hawkwatcher, I recommend either of those spots, or one of the other 30-40 hawkwatch sites in this state alone. Check the Hawk Migration Association of North America Web site (www.hmana.org) for a site near you. Maybe I'll see you on a mountaintop sometime this season. I took this photo yesterday when I happened to catch the sun shining through this leaf. To me, the leaf is starting to look a bit faded and not as plump as in the spring. Today clouds darken the mountain, and I was a bit surprised to find that it was too dark for a morning photo. It's that time of the year again, at least on cloudy mornings. I am finding other signs of impending fall, too. I had't been out on my back deck since the rain two days ago, and last evening I was surprised to find it covered with dead leaves. These are the leaves that turned color during the month without rain. Still, I wasn't expecting leaves to be ankle deep on the back deck just yet. The dogs and I are seeing the fox every morning. It doesn't always follow us. Sometimes it watches us from a rock or a ditch. Most of the time I wouldn't see it at all except for the eyeshine my headlamps reflects. The dogs see better in the darkness than I do and act up when they see it move. My blogging may well be a bit spotty for a few days. I'll be hawkwatching. The Broadwings are flying! Yesterday, Hawk Mountain counted over 1000, so they are on the move. I am hoping I find a few over my mountain, too. I am starting to worry about the pair of foxes that live near me. They are becoming rather habituated to people, even to Dog and Baby Dog and me. For the past two mornings, one of them has followed Dog and me on our now pre-dawn walks. And they have not followed at a distance not have they disappeared when Dog or Baby Dog puts up a fuss and I bark orders at the dogs to attempt to quiet them. It is common for us to see one or both of the foxes. But this trailing and following us, once at a distance of no more than 30 feet, is new. The first time was Monday. Dog and I with the headlamp were up in the north parking lot, heading back to the cabin as we finished our early morning walk. Suddenly Dog lunged against the lead, and I had to hold on with both hands. For a second or so I had no idea what was going on. I thought he'd seen a deer, maybe. Then my headlamp caught the eye shine, and I saw the white tip to the tail, a flash of moving legs. The fox was likely heading back towards its den after a night of hunting, and I thought the brief, if close, sighting was interesting. Dog continued to lunge on the lead, and I thought he was just being overly dramatic. I tried to keep walking, telling him "no" and "bad dog" and other stupidities. And then I realized the fox hadn't run off when it simply disappeared out of my view. It was still there. Dog continued to lunge against the lead, half-choking himself on the nylon collar. I kept dragging him away and after 20 yards or so, he settled down a bit, and I thought the incident was over. Then I saw the fox again, behind us, trotting, stopping, looking. 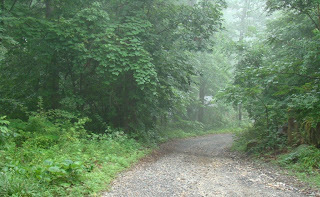 Eventually, I got Dog and myself back to the cabin--me with aching arms. This morning it happened again, twice in fact. This time the fox was no more than 30 feet away. I first saw it among rocks in a low area. Dog lunged, as he did before. The fox looked at us with what seemed like curiosity, trying to get a better view. Perhaps it was trying to figure out why we were there. Perhaps it thought itself hidden by the near darkness. Perhaps it smelled the doggie treats in my pockets. Perhaps it smelled something familiar about Dog's canine smell. It also occurred to me that Dog's half-choked gasps sounded similar to the fox's bark--all air and little voice. So perhaps that's what sparked its curiosity. My voice and dog's lunging didn't cause it to immediately run off, but we did get back to the cabin without further incident. Then when I took out Baby Dog, we saw the fox again. Baby Dog barked and did her funny little hop, run and stomp that she does when she's trying to show how fierce she is. This time, the fox kept its distance. I saw both foxes last Saturday, I think it was, when Baby Dog and I surprised them at the bottom of the lane. One, the female I think, bolted immediately. The other stayed and stared at us for a minute or so. Both looked healthy and beautiful. So I'm not really thinking that some awful disease is the cause of this lessening of natural wariness. I am worried that come hunting season this lack of wariness will result in one or the other of them getting shot, and I hope that doesn't happen. I like having them around, hearing their weird little barks. I would be just as happy if they stopped following us, though. Another storm has passed, and fall now feels ever more settled in on the mountain. The early morning had a nip to the air that wasn’t there just 24 hours ago. I am starting to think about closing the cabin windows and wondering if tonight is the night I should bring in the plants that summered happily outside on the deck. Perhaps not. Perhaps not just yet. Another day, perhaps a week, and then it will be time. For now, I will let them enjoy a few more days of sunshine and let them feel the night’s nip another time or two so they know I did not deprive them of days they might better have enjoyed outside. For them, winter is long enough. The days inside must seem endless and the summers short. In the spring they will look peaked, and I always hope it will warm up fast enough to set them out again before they die. By the time summer ends, they look fantastic and lush, and I want them to hold onto that as long as they can. Another day. Storms are moving through Roundtop again. It was brighter at 6:30 this morning than it was at 7:30 a.m. The approaching storm made it too dark to take a photo amongst the trees in my little corner of the forest. By the time I left the cabin this morning, it was nearly as dark as midnight. Beyond the cover of the forest, the morning looked only a little less dark, but it was bright enough to grab a shot before the sky opened up and the thunder rattled the hills. I don’t like being away from the cabin when a strong storm of any kind is overhead. I think it is simply because I feel I will be able to do something if a tree falls on it or the basement fills up. I don’t like being at work with the worry in my head that something might have happened and that I won’t be able to see it or deal with it until I get home. Now, the odds are that nothing has happened, but until I know nothing has happened I won’t be able to relax. Indeed, the leading edge of this storm has already passed, and autumn will blow in behind it. In the space of 3 days, the season has turned. Summer humidity is gone and the forecast shows no indication it will return. The nights now call for a blanket on the bed (albeit a light one), and the cats suddenly want to cuddle. Hurricane Hanna’s breeze brought down most of the drought-withered leaves. They now litter my lane like a harbinger of the fall to come. The other result of that is that the forest suddenly looks green again, instead of green and yellow, but the shade is now that deep, dull green that is the last green before the leaves turn bright and then fall. Fall is a favorite time of year for me. I like the weather. I like the coolness. I love the glorious shades around me. I like the changes I can see each day. Summer seems too static to me, too unchanging (though on some level I know summer is not as static as I feel it to be). Fall has drama but it's an ongoing drama, not the lightning bolts of summer. Fall suits me more and gives me nearly 2 months in which to enjoy it. I will revel in it. Happy fall! Hanna is Gone! Fall is Here! Hurricane Hanna turned Saturday into a very wet and rather windy day here on Roundtop, but arrived and disappeared so quickly it now feels as though she was never here at all. Friday was a lovely day, if warmer than I like. Saturday morning brought Hanna and with it heavy rainfall totaling about 3 inches through late afternoon. The wind picked up in the mid-afternoon but was never severe. The rain stopped suddenly around 5 p.m. and by 9 p.m. the stars were out. Sunday was a picture perfect and cool day. Hanna was already long gone. So Sunday, I needed to get out and walk around, after being cooped up inside all day on Saturday. I’d like to report that I discovered a new species of something or saw the extremely rare something else, but that’s not the case. Sunday was simply a beautiful and cooler day with perfectly blue skies. Now that Hanna has passed, it’s probably likely that the turn towards fall will grow ever more pronounced. It’s not likely that I will have any more 90+ degree days—not that this summer brought very many of those. I may not even have many, if any, more 85+ degree days. And it’s entirely possible that days in the 80-85 degree range could also be in short supply. And for at least the next week the weather will be in the 75-80 degree range—typical for this time of year. With the passing of Hanna, migration should also really begin to pick up this week, and not just for my beloved raptors, either. I am already seeing some of that. Yesterday I heard and briefly saw an olive-sided flycatcher. I didn’t have my binoculars with me, so all I really saw was a tiny flycatcher sitting on the top of a dead snag, some 50 feet up. But I heard that distinctive "quick, three beers" call. Olive-sided flycatchers have a particular propensity for dead snags to perch on, preferably, I think if they are on the top of a tree. For many years a dead snag on North Lookout at Hawk Mountain was a favorite spot for them. I suspect hundreds, if not thousands, of birders got their first looks at this flycatcher, myself included, when one stopped and stayed for a bit on that particular snag. So now is the time to dust off those binoculars and get out the field guides. Migration season is on its way! I know I don't usually post photos of the same thing--or in this case the same species of bird--so close together, but this American Goldfinch was just begging for it this morning. And perhaps it's not such an awful thing, as posting another photo of a goldfinch simply illustrates how commonly I'm seeing these thoroughly lovely little birds right now. Of course, I do like to hang out in this little thistle patch they're so fond of. It's not just the goldfinch that like this little 8-10 foot wide patch between the woods and a dirt road. Unfortunately, for me and my photos, though, the goldfinch are proving the be the easiest of the visitors to photograph. The thistle patch this morning also hosted some tiny butterflies, a female Ruby-throated Hummingbird, a brownish mid-sized bird that I never got close enough to identify, a Northern cardinal and a host of small sparrows that didn't want to come out of the cover for even an instant. And that was just in 5 minutes. As soon as the weather clears--after Hanna blasts through this weekend--I will take a chair and plant myself in this spot in hopes of photographing at least a few of those other visitors. And speaking of Hanna: I'm due to get some rain from this system. The forecast doesn't sound awful for my area, but forecasts aren't reliably accurate, so who knows what the hurricane will actually bring? Coastal hurricanes can often produce good birding at inland areas like mine. It is pretty common for terns and gulls of various species that are never seen around here to show up in farm ponds or in fields to escape the path of a hurricane as it rides up the coast. Once I had Caspian Terns on one of the old snowmaking ponds. Actually, Caspian Terns seem to be the most common evacuee I do see, though they usually prefer to evacuate to a nearby river or large lake. So I am hoping to escape the severest of the weather, but I am hoping I just might get an interesting evacuee or two. 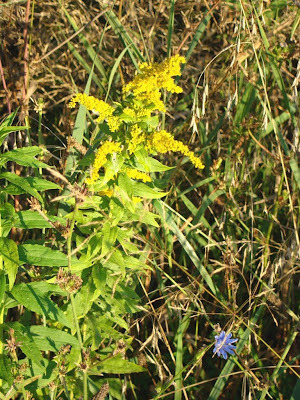 Yes, it’s a goldenrod. Likely because I am not allergic to this plant, I find them quite pretty. Golden colors seem to follow me everywhere on the mountain right now. Goldfinch, goldenrod, even the withering leaves are at least temporarily golden. The longer shadows of the early September mornings are taking on a golden hue. After the whiter, harsher light of summer, the change is both noticeable and welcome. It is beginning to feel like fall, or at least it no longer feels like summer to me. It’s odd, too, in a way because today’s temperature and tomorrow’s will be near 90 degrees, rather warm for this time of year, rather warm by the standards of this cool summer. And yet, it simply no longer feels like summer. Perhaps it is the warmer, more golden light. Perhaps it is something else, something I can sense, though it is not something I can pinpoint intellectually and describe precisely what it is. I have learned and continue to learn to value my senses and the things they tell me. Not always being able to explain what my senses tell me doesn’t diminish the value of their lessons. Some things are so primal that words aren’t necessary. Like the coming of fall. I can smell it. I can feel it. Deep within that primal part of me, I know it. 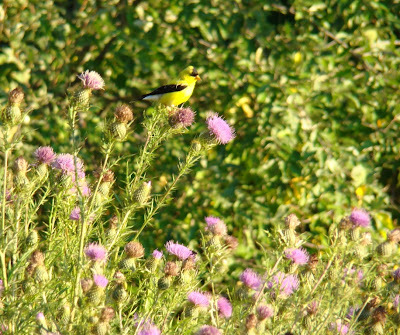 I found this lovely male American Goldfinch early this morning as I was leaving Roundtop. My first confession of the day is that I didn't notice this lovely bird until I thought I had already snapped my morning photo for this blog post. I was taking a photo of the mother of all thistle plants. It was much taller than I am, as tall as a small tree. 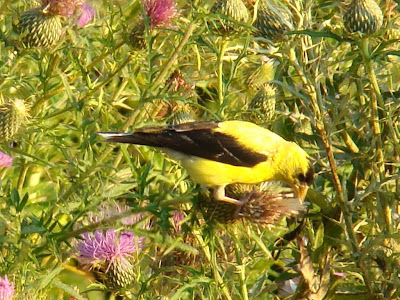 When I finished, I turned and discovered Mr. Goldfinch, who was probably wondering what in the heck I was doing in his thistle patch. He stayed long enough for me to take a few photos of him. Now for my next confession. I thought I knew what the species was of the tree with red berries that I posted for my Friday quiz, but I am no longer sure that’s the case. I even asked a person I know who knows a lot about trees, and I ended up with yet another answer. Of course, all the people I asked saw the photo and not the tree itself, so that may be part of the problem with the numerous identifications. Here’s the rundown of possible species. I though it was a black cherry tree (also known as wild cherry). I confess, however, that I didn’t pay much attention to the tree when I took the photo, as I was actually photographing something else and suddenly saw the berries over my shoulder, so I quickly grabbed the shot and moved on. I did think I could relocate the tree to confirm the identification, but that has not proved to be the case. Serviceberry has also been mentioned as a choice, as has hackberry and dogwood. All these choices have at least a few issues, so let’s go through the choices and see where that takes us. Hackberry: Twigs are hairy, the base of the leaves are rounded and one side of the leaves are toothed. In my photo, the base of the leaves are as pointy as the tips. The leaves have no teeth, and the stems don’t look hairy. So let’s cross this one off. 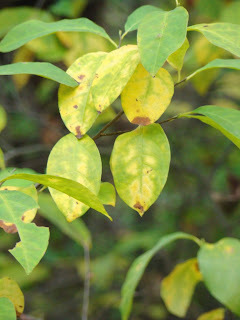 Serviceberry: Leaves are pointed and notched at base, finely saw-toothed, 11-17 straight veins on each side. This sounds good up to the saw-toothed leaves. 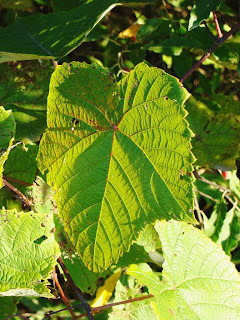 Try as I might, I can’t find any evidence that the leaves are saw-toothed, even finely. And there aren’t 11-17 veins, and the veins curve near the tip of the leaf., so I think I have to rule this one out. Black cherry: leaves elliptical, finely saw-toothed (there’s that word again) with curved or blunt teeth (whatever that means), dark bark with horizontal lines on the tree’s trunk and an elliptical stone to the fruit, which starts out red and then turns blackish. I still can’t see anything that looks like the leaves are saw-toothed, even if it’s a blunt or curved kind of saw-toothing. 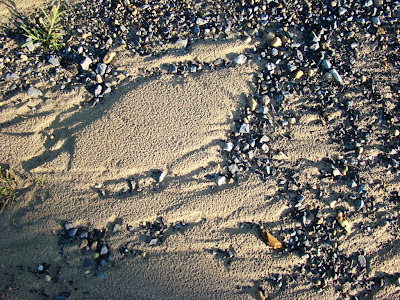 The dried berry or stone in the middle of the photo does look elliptical. I see no evidence that the fruit is turning black-ish, though. If anything, it appears to be going from red directly to the brownish stone. So I’m thinking this guess isn’t right either. Dogwood: Leaves are elliptical (so far so good) that appear not toothed but tiny teeth are visible under a lens (okay I’ll give this one a pass) with 6-7 long carved veins on each side of the mid-vein. So far this one sounds good. Fruit is berry-like, elliptical and shiny red with several at the end of a long stalk. Okay, I was all ready to buy into this one, right up until the long stalk, which this tree doesn’t show at all. And the photos of the dogwood berry all show 4-5 berries clumped together, which is how I'm used to seeing them, but this tree shows no more than two and that just once. The other berries are all singles. Still, of all the guesses, this one seems to have more of the identification points than the others. So maybe it’s a dogwood. (Congrats to sister on this one) But I still want to find that tree again for one final check. Isn't that just how it goes? Just when you think you know something, you find out there's more to the story. But that's what makes it fun.